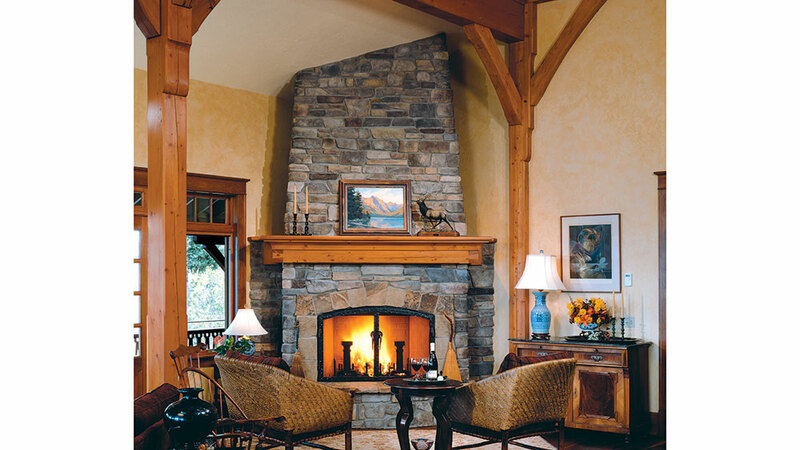 A California couple goes back in time to create their chalet-inspired Montana timber home. It’s not easy creating a new home that instantly boasts a vintage flair. 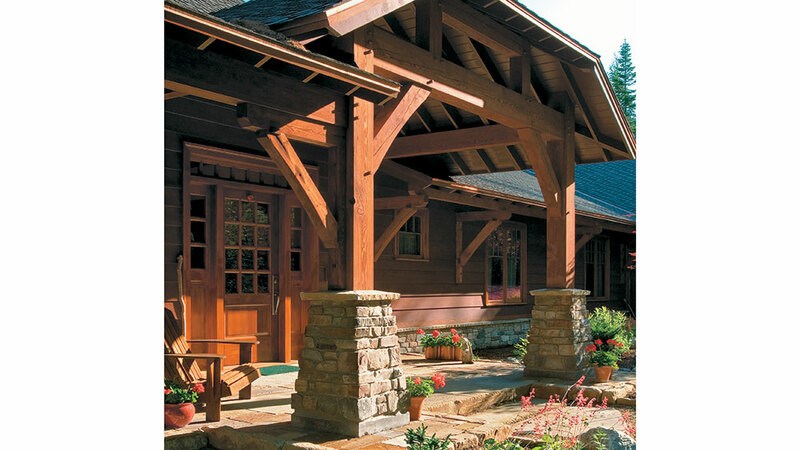 Timber homes certainly make the chore easier, given their abundance of traditional charm. But “instant classics” are elusive to many homeowners because most modern materials don’t always evoke a bygone era. That is, unless historic treasures are in your own backyard to serve as your muse. Tucked alongside the eastern shore of Montana’s Flathead Lake sits Greg and Doreen Faull’s exquisite timber home. And less than an hour’s drive away, in West Glacier, Montana, you’ll find the historic Belton Chalet and Belton Depot, which served as the home’s inspiration. “We wanted something that looked like it was a hundred years old, but still was comfortable in a modern way,” notes Greg. Originally from Southern California, the Faulls had frequently traveled through western Montana on their way to the Canadian Rockies, where they vacationed for 22 years. “It was always in the back of our minds to retire here,” Greg explains. When they finally decided to make the move, they hooked up with a broker and home inspector to look at a few homes that had already been built in the area. From there, the Faulls compiled a list of recommended architects and contractors. Bigfork Builders, run by Andy Fischer and Brad Reedstrom, and Richard Wyman Smith, AIA, who has an architectural practice in Whitefish, Montana, were on the top of that list. Once the Faulls found out that the two companies had worked together in the past and also had worked with their chosen timber provider, Jake Steck from Wild Mile Woodworks, they decided to meet with the whole group to show them the lot and describe their vision. Upon meeting, it became clear to Greg and Doreen that they had picked the perfect team to work with. “Richard is extraordinarily creative, and they were all familiar with the Belton Chalet, which was a huge help,” Greg recalls. 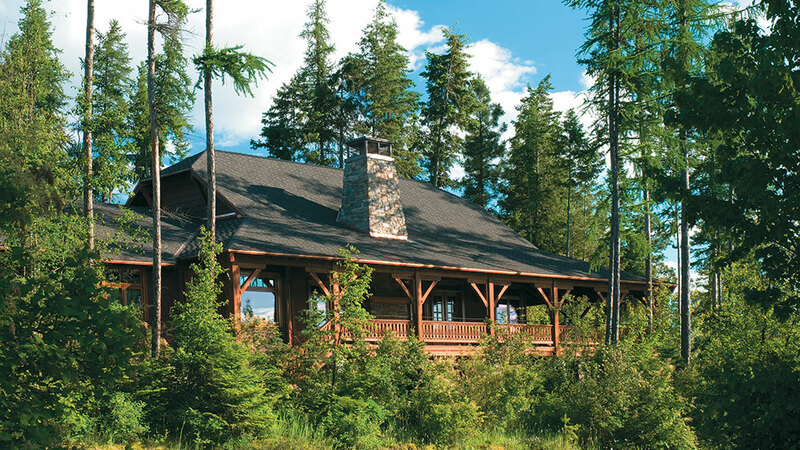 The finished home features a mix of timber frame and conventional construction. Vertical grain fir enhances the exterior door and window casings.Reclaimed and standing dead larch timbers were used to create the great-room trusses, covered deck and the roof structure of the entry patio and garage apron. 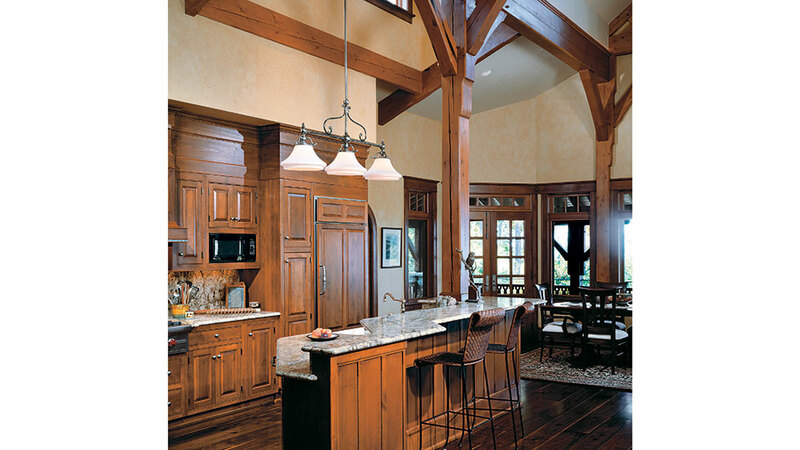 The interior doors, wainscoting, finish trim and cabinetry were crafted from select alder. In short, a perfect place for Greg and Doreen to make their own history. Although Doreen loves to garden, the Faulls had the property professionally landscaped. The final result: lots of greenery mixed with azaleas, peonies, delphiniums, Siberian irises, daffodils, daisies and lilacs. 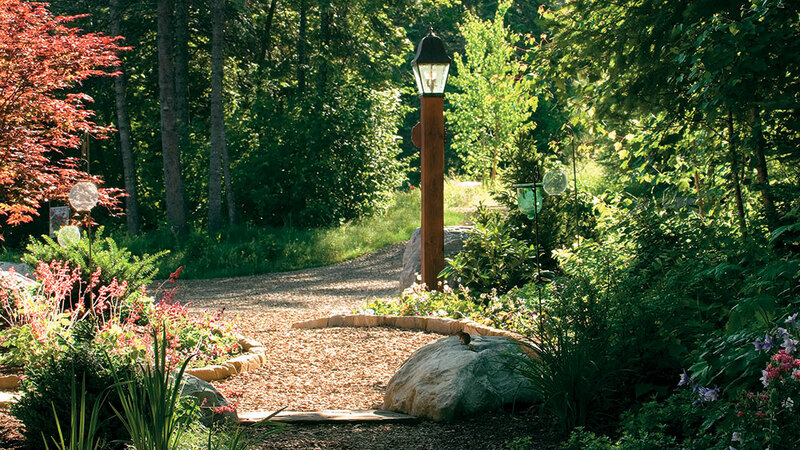 “We had an incredible landscaper and wanted it to look natural with a little refinement,” she says. The front door features a raised panel and 12 glass windows. It’s flanked by a pair of side windows and crowned with an eight-window transom. The kitchen, featuring rich wood cabinetry and granite slab countertops, was designed to be part of the living area. “I didn’t want the kitchen to look industrial,” says Doreen. Motorized clerestory windows let in sunlight and help keep the room cool. 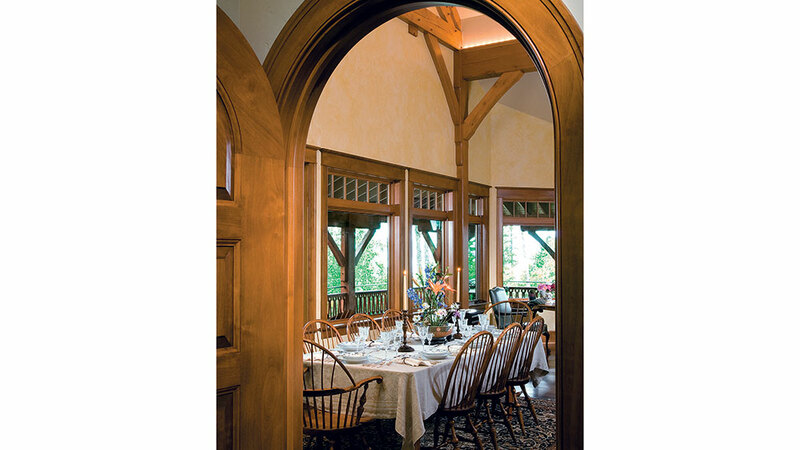 A dramatic archway looks into the expansive dining room, which can hold up to 30 people when extra seating is brought in. The homeowners frequently entertain and are visited by their daughter and grandchildren several times a year. A soft champagne shade on the walls adds warmth to the great room. When they have guests over in the winter, the Faulls often find themselves in front of the stone fireplace. The ceiling in the airy great room is about 20 feet high. The 8-inch-wide, long plank flooring is made from solid black walnut. The bedroom has an old-fashioned ambiance, and features a mahogany four-poster bed and chest made by Greg. Pocket doors with elegant handles can be closed to separate the space from the attached office/sitting room. 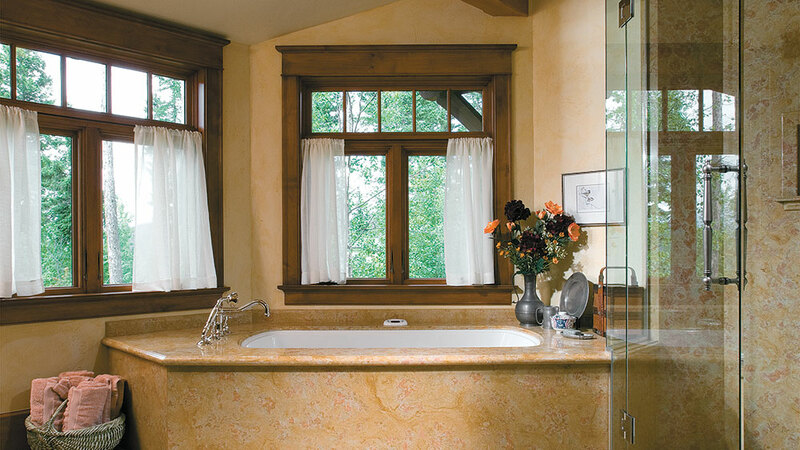 Surrounded by windows, the bathroom features a jetted acrylic tub, honed marble flooring and a wide walk-in shower. Doreen enjoys relaxing on the deck and admiring the stately Grand fir, Ponderosa pine and Tamarack trees that surround the house. 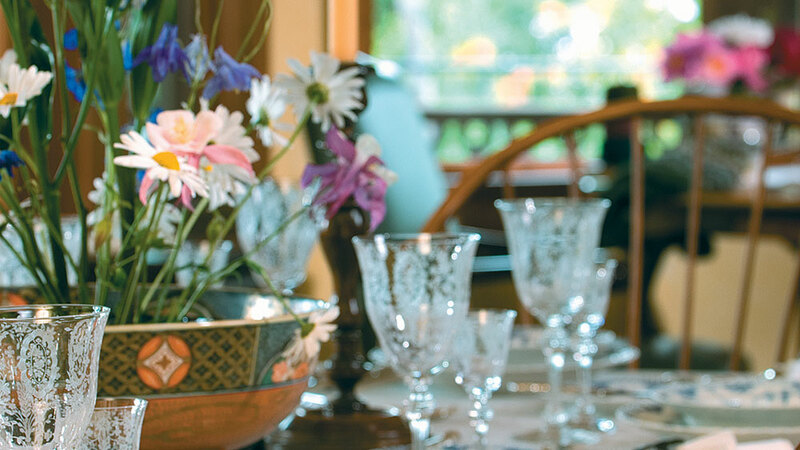 The dining-room table is set with many cherished pieces, including an Amari bowl filled with flowers that are native to the area. 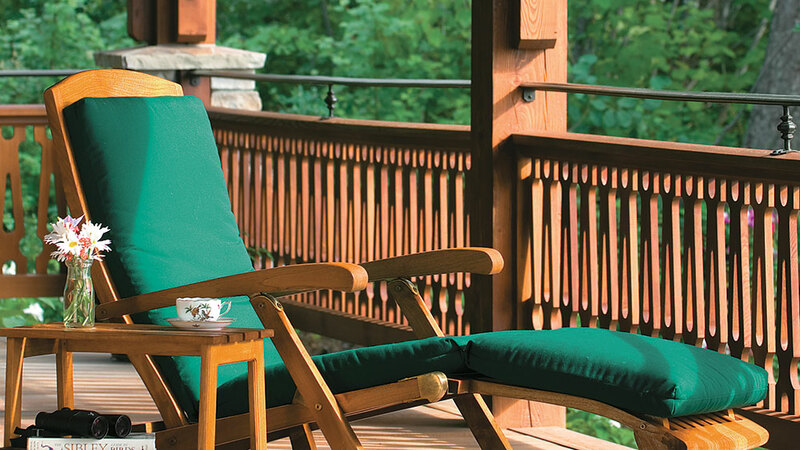 The Faulls’ deck best reflects the architectural spirit of the Belton Chalet. Borrowing from the handrail design at the chalet, Greg used his woodworking skills to make all 270 of the handrail pickets.